(I hope you like the new background I designed). Welcome to the "Building Friendships Blog Hop!! You should of arrived here from Brenda's Blog, and if not, you will want to start at Heidi's Blog. I wouldn't want you to miss out on any of the Fabulous Giveaways that each gal has made!! Each of us has created a unique project. Not only will we be sharing these creations with you, we will be offering them up as prizes too!! Who doesn't LOVE to win a beautiful creation?? Here are the Details. You need to leave a little love in the form of a comment on each of our blogs by 12 midnight EST Wednesday, August 22nd. You need to become a follower of each of our blogs. You will need to gather all the letters and words along the way and put them into a little sentence and email the sentence to Heidi at pinkprincess67@gmx.com. All correct entries will be put in to win the prizes. Prizes will be posted on each of our blogs on Saturday August 25th. Here is a look at what I created!! 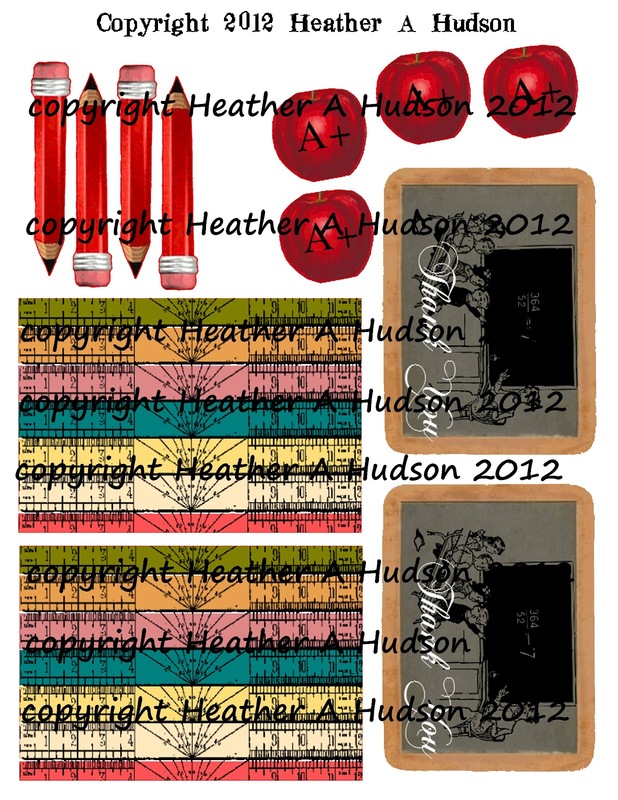 Here is a list of the embellishments from Pro 31 Designs I used on the cover. I used GIMP (image manipulating program) to alter the images from Gecko Galz. Leanne gives me the best images to play with!! I just love the books...and my favorite Champagne flatback pearls!! I used Inkscape (a vector / line program) to create cut lines for all of my images, so when I figure out where I put the new blade that Sherri (Black Cat Cougar Digital cutters), sent me, I can cut out another one of these :0) All of you who know me, know I love my Kitty Kitty Digital cutter!! I designed the Ruler paper by taking a ruler image, getting rid of the white background and adding in colors that I liked. Then I stacked a bunch together to form the paper. You can see how to do this yourself by watching my GIMP tutorials on you tube. My Regular visitors know that I love to create "Shaped pages" so I designed my pages so that the apple peaks out on the first page, pencil would peak out on this page, the next has a vintage report card, and finally a ruler pocket. These little treasures are on pop dots (paper still on, so not all sticky yet), so you can slide in a note or photo, then stick the die cuts down. Another lunch back to hold some goodies!! The clothes pin that I altered for the Design Team Challenge at PRO 31 Designs. and the extra pieces below...so you can "Make it your own" if you are the winner!! Here are two thank you cards that I made using a Digital Collage Sheet that I created. You can find the sheet below in my Etsy Shop. The apple image and image on the chalk board are from Karen the Graphic's Fairy. You can watch my Tutorial on how to create the cards from my Collage Sheet. Thanks again for joining us in our Building Friendships Blog Hop!! You will want to hop on over to Laura's blog to see her wonderful creation and a chance to win another prize!! Simon says Stamp and Show: Favorite Technique. Yayyy. I knew you would love the "smash book" idea. They are so fun to make and yours is fabulous!!!! Love it. You should make up some more and put them in your Etsy shop so we can all get one. HUggs and Luv from your BFF. You should come play next week and see what kinda trouble we can whip up. The new paper shipment is coming in...you better get some before I take it all for myself lol. Just wanted to compliment you on a great post with lots of info, though I won't be able to participate. Great images too! What a great smash book. Love all the detail. You did a marvelous job creating this prize...scratched that..."treasure"!!! Heather this is stunning, what a beautiful project! This is amazing! What a wonderful school themed book! Fabulous elements, all so wonderfully placed. Love your smash book! The images are great, love those rulers! Fabulous Back-2-School creation!! Thanks so much for playing along with us at The Pink Elephant Challenge this week!! Heather!!! I am blown away! I love, love your book, every time I visit you have made something that takes my breath and this is no exception! LOVE IT!!! Beautiful book. The details are so charming and sweet! Glad you joined us at Simon Says Stamp and Show. Amazing "Smash" book! Well done! Thanks for joining us at DYSU. This is just awesome! So many great details. Thanks for joining us at Do You Stack Up. I love this book it is A.M.A.ZING! I'm a flat back pearl addict too, in fact I woke up with two attached to my lower leg as if I had had implants overnight! Love your glittery Pin It button too. Thanks for sharing - Fabulous! Finally found the comment section. Yours was the most beautiful project and the hardest comment section to find. Love the colors you used on your beautiful smash book. Lots of fun details. Wow, Heather! This is such an amazing project!!!! Awesome! This is such a cute memory book! Fantastic book - such gorgeous detail. Very good Heather, but wouldn't expect anything less, you always do a great job. Heather, I love your project! This is so pretty! I love your site, I found you on You Tube! P.S I sent you a message on Facebook via Pinterst! Heather this is just gorgeous. Love the colours and embellishments. All the elements work so well together. I saw this on MIM and just had to pop over to have a closer look. Hope you are having a fab Thursday. Hop on over to Doing Life - for a chance to win some lovely digi stamps from DS4J to the value of 20$.